New Covenant Schools - Where do the Grads Go? Where do the Grads Go? Current and prospective parents often ask what our students do after graduation from the School of Rhetoric. They’re really asking a couple of questions, “Where do they go to college?” and “What careers do they pursue?” My standard response is, “Anywhere and anything they wish!” I have long believed that a classical, Christian education prepares a student for the next step in life across a broad horizon of interests. While it’s true that nearly all of our students pursue college or university, the education they receive in our halls enables them to fulfill whatever God’s call on their lives may be. A classical, Christian curriculum might be expected to attract and slant students heavily toward the humanities. Predictably, 20% of our graduates have majored in this area, which includes English, classics, law, and language studies. Another 18% have gravitated toward the social sciences such as psychology, education, political science or international studies, often with modern languages as a minor. 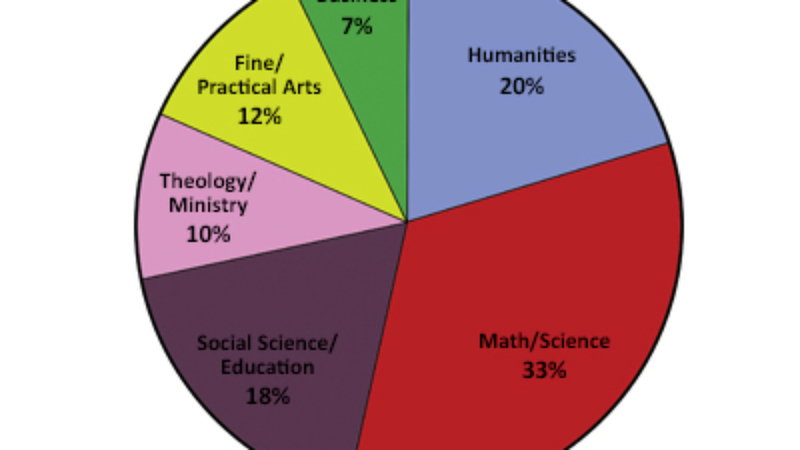 Nearly a third of our graduates are divided into three smaller categories of theology, ministry-related fields, fine arts, or business. By far the largest single category, however, has been the number of students who have majored in math or scientific fields, preparing for careers in computer engineering and software development, medicine, nursing or biology, as well as civil, electrical, or industrial engineering. This should not be surprising. Mathematics and related subjects are part of the seven traditional liberal arts – grammar, dialectic, rhetoric, mathematics, music, astronomy and geometry – and as such hold a significant place in the New Covenant curriculum.